NAIROBI, Jan 31 2017 (IPS) - Too hungry to play, hundreds of starving children in Tiaty Constituency of Baringo County instead sit by the fire, watching the pot boil, in the hope that it is only a matter of minutes before their next meal. Unbeknownst to them, the food cooking inside the pot is no ordinary supper. It is actually a toxic combination of wild fruits and tubers mixed with dirty water, as surrounding rivers have all run dry. Tiaty sits some 297 kilometers from the capital Nairobi and the ongoing dry spell is not a unique scenario. Neighbouring Elgeyo Marakwet and Turkana County are among the counties spread across this East African nation where food security reports show that thousands are feeling the impact of desertification, climate change and rainfall shortage. “In most of these counties, mothers are feeding their children wild fruits and tubers. They boil them for at least 12 hours, believing that this will remove the poison they carry,” Hilda Mukui, an agriculturalist and soil conservationist, told IPS. Mukui, who was head of agriculture within the Ministry of Agriculture and worked in most of the affected counties for more than two decades, says that rainfall deficit, shortage of water and unusually high temperatures is the scenario that characterizes 23 out of the 47 counties in Kenya. The situation is so dire that in Baringo County alone, 10 schools and 19 Early Childhood Development Schools are empty as children join other family members in search of water. “Sometimes once you leave in the morning to search for water, you return home in the evening,” Lokwee told IPS. In other affected counties, especially in Western Kenya, communities have resorted to eating insects such as termites which were previously taboo. Though these unconventional eating habits are a respite for starving households, experts warn that this is a ticking time bomb since the country lacks an insect-inclusive legislation and key regulatory instruments. In the Kenya Bureau of Standards, which assesses quality and safety of goods and services, insects are labeled as impure and to be avoided. But if predictions by the Ministry of Water and Irrigation are anything to go by, the worst is yet to come as the country watches the onset of what experts like Mukui call a crisis after the failure of both the long and short rains. “We are now facing severe effects of desertification because we are cutting down more trees than we can plant,” she explains. She added that Vision 2030 – the country’s development blueprint – calls for the planting of at least one billion trees before 2030 to combat the effects of climate change, but the campaign has been a non-starter. Mukui told IPS it is no wonder that at least 10 million people are food insecure, with two million of them facing starvation. According to the United Nations Convention to Combat Desertification (UNCCD), which works in countries such as Kenya buckling under the weight of desertification, land degradation and severe drought, the number of people living on degraded agricultural land is on the rise. Agriculture is the mainstay of the economy, with at least 45 percent of government revenue being derived from this sector. 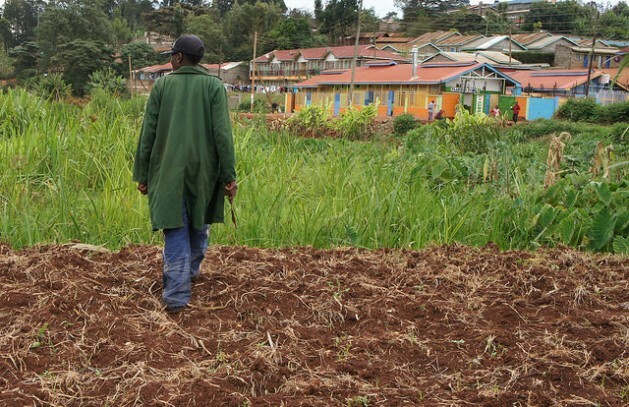 Mukui says it is consequently alarming that at least 10 million of the estimated 44 million Kenyans live in degraded agricultural areas, accounting for an estimated 40 percent of the country’s rural community. Other statistics by UNCCD show that though arid and semi-arid lands constitute about 80 percent of the country’s total land mass and are home to at least 35 percent of the country’s population, areas that were once fertile for agriculture are slowly becoming dry and unproductive. A survey by the Kenya Forest Service has revealed that not only is the country’s forest cover at seven percent, which is less than the ten percent global standard, an estimated 25 percent of the Mau Forest Complex – Kenya’s largest water catchment area – has been lost due to human activity. “Land issues must become a central focus since land is a resource with the largest untapped opportunities,” she said. Research has shown that the state of land impacts heavily on the effectiveness of policies to address poverty and hunger. Restoring forest cover in Kenya is key. Since 1975, official government statistics show that the country has suffered 11 droughts – and the 12th is currently looming. The cost implications that the country continues to suffer can no longer be ignored. UNCCD estimates that the annual cost of land degradation in Kenya is at least five percent of the country’s Gross Domestic Product. And addressing land degradation can earn the country four dollars for every one dollar spent in land restoration efforts. Barbut has, however, commended the country’s efforts to address desertification caused by both human activity and the adverse effects of climate change, particularly through practical and sustainable legislation. Mukui says that UNCCD works through a country-specific National Action Programme which Kenya already has in place. “What we need is better coordination and concerted efforts among the many stakeholders involved, government, communities, donors and the civil society, just to name a few,” she said. Efforts to enhance the country’s capacity to combat desertification by the UNCCD include providing financial and technical resources to promote management of local natural resources, improving food security and partnering with local communities to build sustainable land use plans.